This city-based jewellery brand by a depression survivor delivers unique handcrafted designer jewellery to your doorstep. The brand is a creative start up by Aditi Chakraborty, a strong independent entrepreneur, whose passion has always been designing and, not just the regular designs. Her label is known for its unusual patterns and designs which can jazz up any outfit, that too at prices that won’t bust your wallet. Aditi draws her inspiration for her designs mainly from Indian folk, cheetara, Kalighat paintings, and nature. The necklaces are to die for and are mostly made of clay, with uncommon patterns that you’ll definitely not find on somebody else in a party. 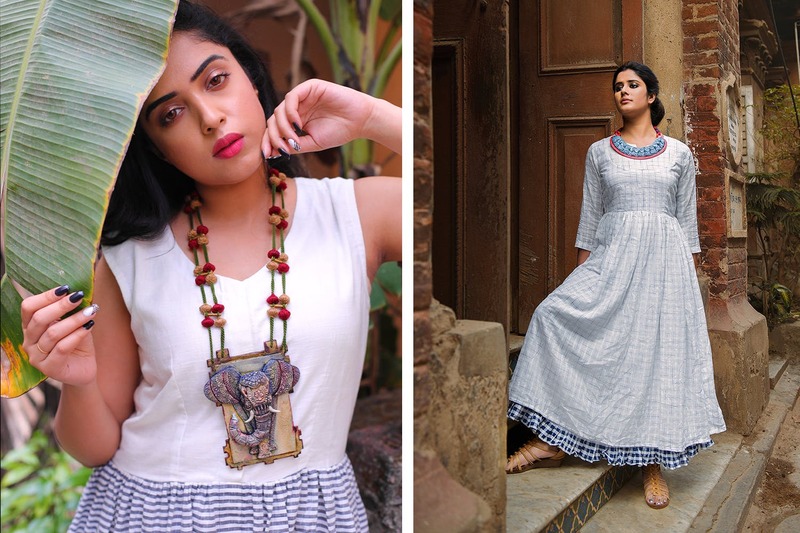 Aditi’s products have often been featured in Kolkata’s renowned fashion magazine- Sananda and currently she is working with Novika, a National Geographic website. Apart from vast collection of jewellery, she also has a collection of apparel. Prices are between INR 500 to INR 3,600. For her exclusive range, they start from INR 1,500. Her clothing range is between INR 1,800 to INR 6,000. Delivery charges start from INR 50 for customers in Kolkata and INR 100 elsewhere.